Pre-heat your braai / bbq. 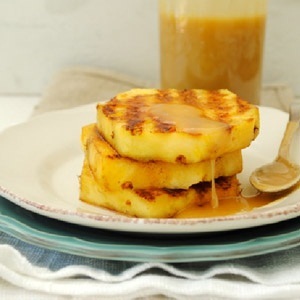 Sprinkle the cinnamon and sugar over the pineapple slices and lay down onto the braai grid for 1-2 minutes, or until just charred and blistered and golden. Serve with a drizzle of salted caramel sauce, or a scoop of mascarpone or vanilla ice cream. Recipe reprinted with permission of Sarah Graham.